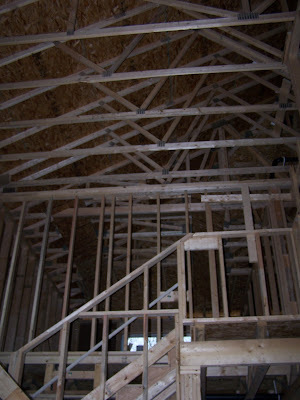 Once you see framing going up on your new home, you get even more excited for completion day. At this point you are able to walk the floor plan and get a better idea of how the space fits together. **first piece of advice – the foundation footprint always looks smaller around framing time and you will think you might have made a mistake, picking a floor plan that is too small. TRUST me, it is just an illusion. For many new homes in Minnesota, it only takes a week to frame the house. One weekend we stopped by and saw the first photo of our new home…by the next weekend, framing was completed all for one small section of the roof, and we were able to walk inside to find the second photo. During our walkthrough of the home, we were able to discover, shortly after framing was complete, that the master bathroom was the wrong design. It was quickly changed once we informed the field manager of the mistake. At this point it is very important that you get out your electrical diagrams and make sure that everything is in place. Outlets could be off a few feet, recessed lighting might be in the wrong place, or cable might be missing out of one bedroom. If you catch these problems before dry wall is installed, your life will be much easier. 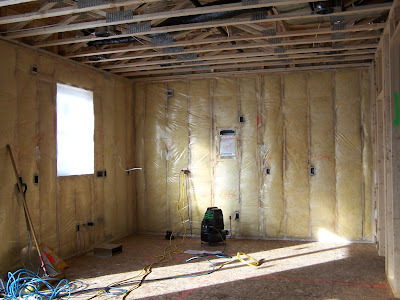 It helps that you will most likely have a Pre-Drywall Inspection with the builder. They will walk the entire home with you, pointing out every detail, and making sure everything meets your expectations. It might take up to three hours for the inspection, but it is well worth the time. In our walk through, we were able to see that a few of the recessed lights were in the wrong positions, which the field manager noted and gladly changed for us. **second piece of advice – walk the house every weekend, especially after installation. Being a part of the progress is extremely important,allowing you to catch mistakes quickly…and without further cost to your pocket book. **If you want to learn more about the luxury side of real estate in Minneapolis, check out my other blog. Thanks for the great tips have a family member building a house just broke ground this week. The company has 4 scheduled walk thrus during the process but your suggestin of visiting weekly sounds like a good idea to see everything is as it was planned for. It is an exciting time and much anticipation. 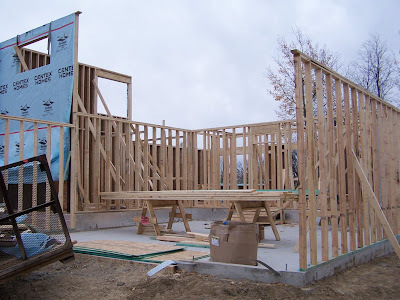 I have also heard that to that it looks smaller once framing goes up and once wallboard goes in it gets big again.